ATLA invites you to the “ATLA Products: Updates on New Content” webinar on Thursday, May 3, 2018, at 1 pm CDT. 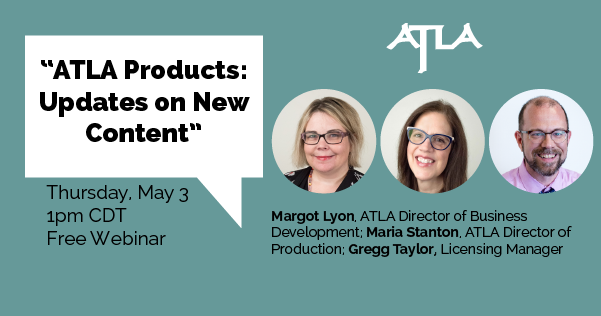 Join ATLA Director of Business Development Margot Lyon, ATLA Director of Production Maria Stanton, and ATLA Licensing Manager Gregg Taylor as they give an overview of new developments with ATLA Products and answer your questions. The ATLA Products team members will provide an overview of new developments with ATLA Products, including ATLASerials PLUS™ (ATLAS PLUS™), an expanded offering of 444+ full-text journals in many diverse areas of religion and theology. In addition, ATLA staff will also discuss enhancements and additions to the ATLA Religion Database® (ATLA RDB®), including the integration of the ATLA Catholic Periodical and Literature Index® (ATLA CPLI®) content. Are there any specific questions or topics you’d like to see addressed? Registered attendees are welcome to email memberrep@atla.com with questions or you are welcome to ask them during the session. If your question is time-sensitive please email support@atla.com or refer to the FAQ on ATLA’s website. Also, be sure to check out our other webinars this spring.